When it comes to your home, every child’s personal library should be a happy place to retreat to. Refreshing your child’s library space isn’t a lengthy process, and it can be done quickly. If your child’s library is collecting dust or is simply needing a makeover, try these four tips to start building a beautiful children’s library right in your own home. 1. Clean out the clutter. A fresh start is often the best way to inspire a new vibe to your reading area at home. Remove all the books from the shelf and start to sift through them. Divide the books into two piles, books your children read often and ones they do not read often. You can toss out the books your children have outgrown or never touched; put them in a bag and donate them or give them to family or friends. 2. Always add new books to your children’s collection: Board books, concept books, fairy tales, picture books, rhythmic books and early readers. Figure out what you don’t have and explore from there. Make sure you have an assortment of various books so you can build a multifaceted collection for your children. Try to incorporate pieces that have a range of difficulty levels, an assortment of genres and a diversity of cultures and authors. In this way, when one of your children is in the mood for a different type of book to read, there will be many options. 3. Make their library fun and inviting with a warm atmosphere. Consider relocating the library to a place where it will get the most use. 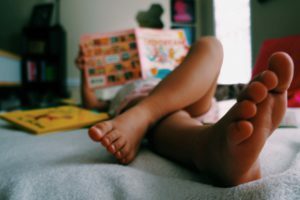 Whether it’s in their bedroom, playroom or family room, you want your children to be able to feel they can easily access their home library and stay a while. Motivate them to search and grab by putting books low on the shelf or at their eye level so they can take books easily and often. Don’t forget to create a reading nook with a comfy chair, bean bag or a soft rug for an inviting space for them to lounge and hang out once they have found books to delve into. 4. Continue to nurture the collection and reading space. As your children grow, continue to keep their library relevant, up to date and aesthetically pleasing. Clean out and add new books as their interests and reading levels change over time. Continue to add to their collection. Don’t be afraid to swap out old furniture, artwork and decor to keep them interested and curious. You always want to keep them fascinated about exploring their space. Sometimes rearranging and adding a few great books is all that’s needed.